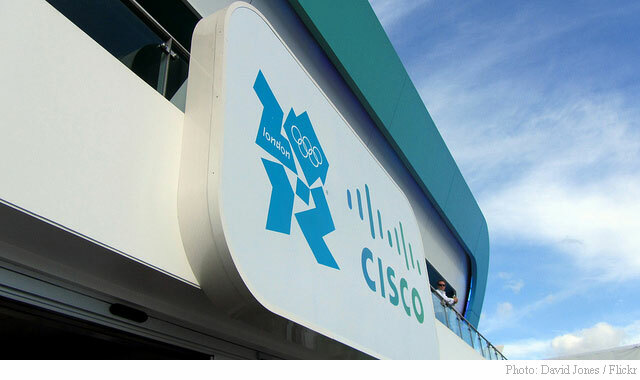 Shares of Cisco Systems, Inc. (CSCO) are higher by 5.35% to $28.15 in morning trading Thursday following positive earnings news late Wednesday. The maker of network equipment reported third-quarter earnings of $12.00 billion, or $0.57 per share. Analysts had been modeling $11.95 billion and $0.55 per share. Net income came in at $2.35 billion, or $0.46 cents per share. It’s worth noting that large IT and networking names such as EMC (EMC), IBM (IBM) and Juniper Networks (JNPR) posted disappointing numbers during the latest quarter. Current-quarter earnings guidance was encouraging, too, with Cisco guiding revenues of $12.36 – $12.73 billion, as compared to analysts’ expectations of $12.43 billion. The management also gave its bottom line range of $0.59 – $0.61 per share, against projections of $0.58 per share. Cisco’s solid print earned it this morning price-target hikes from Wunderlich, to $27 from $24, and from RBC to $33 from $31. RBC said that while they remain cautious given the overall IT environment, they think Cisco is continuing to move in the right direction highlighted by solid margin performance and improving business mix. CSCO stock currently sports a valuation of 11x next year’s earnings. Ticker has a t-12 price-to-sales ratio of 2.71. EPS for the same period registers at $2.02. The name has a current market capitalization of $139.97 billion. As for passive income investors, the San Jose, California-based company pays shareholders $1.04 per share annually in dividends, yielding 3.92%. Five year average dividend yield currently stands at 2.29%.